The idea behind this one is, like every other Gauss Arsenal, to make it the damage type useful. Instead of tweaking enemy Gauss resistances, I decided to take a two-tier approach. 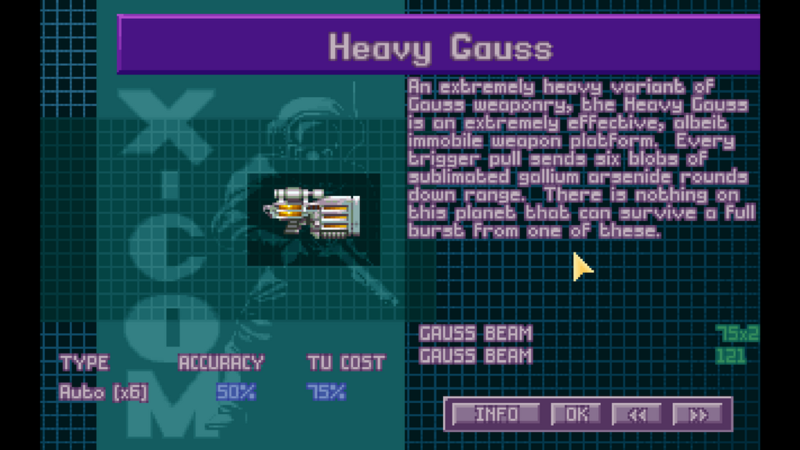 Initial Gauss level damage is not changed, but I made them act like long-range shotguns... and I made the Heavy Gauss like the Heavy Machineguns prevalent in the other mods. High ROF, High TU cost, no Snaps. 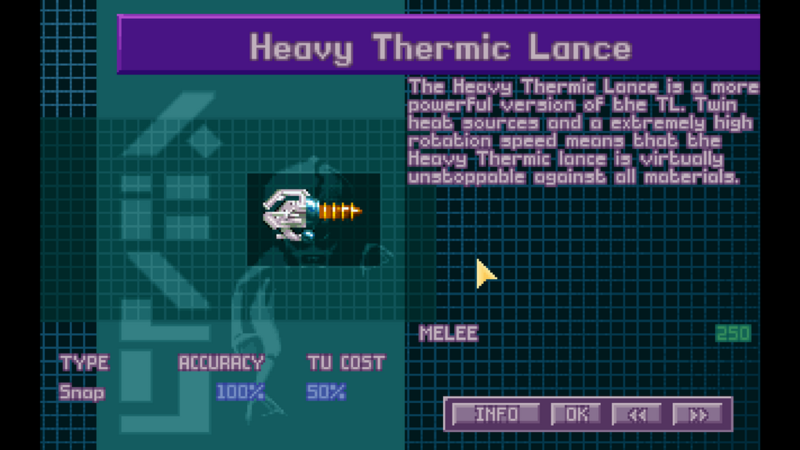 These weapons are extremely useful at short range, but have vanilla-like characteristics at long ranges. Tier 2 Gauss ammo removes / reduces the fragments, but gives them near Sonic damage. 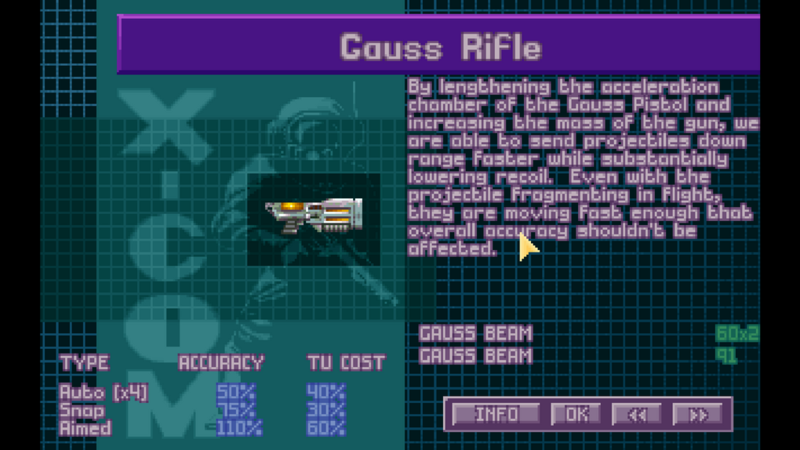 Again, enemies still have the same Gauss resistances, so shot per shot, they do less damage. The major tradeoff being that you have a viable long-range automatic weapon. 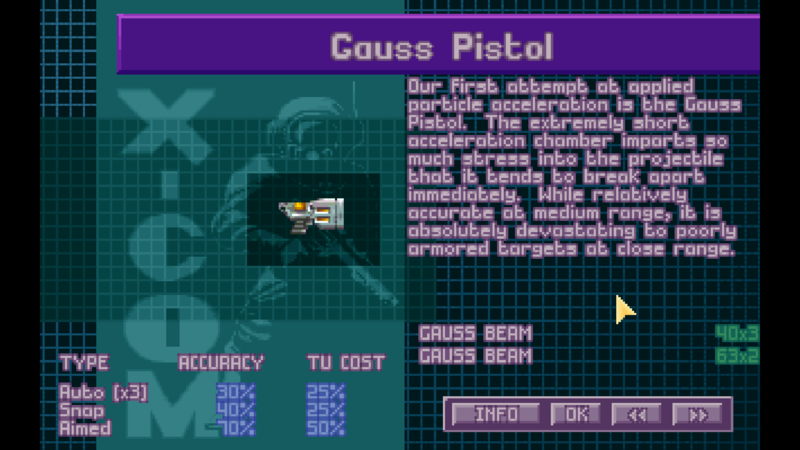 That said, the Gauss Pistol becomes an extremely useful lategame weapon for off-hand use and your Ion Armor is still 99% immune to it, so you can give it to your low MC Strength troops. Tier 2 ammo also requires requisite sonic ammo research. The final modification is that I modified the Heavy Thermic Lance to work as a wall-breaching weapon. It is no longer a 'melee' weapon, instead it has a firearm range of 1 - this allows it to be used to breach UFO hulls without wasting DPL ammo. The downside is that it can trigger reaction fire from anyone that that survives it's attack AND enemies have no problem using on your troops and tanks hovering 1-tile off the ground.